The Perfect Martini is shaken and not stirred and starts with gin poured over ice, vermouth and finished with our Martini Style Olives – Perfect! Be creative and drop in any of our other fabulous stuffed olives such as Turkish Pepper Stuffed for a truly unique experience. Your choice…shake or stir ingredients together. Pour into a martini glass. 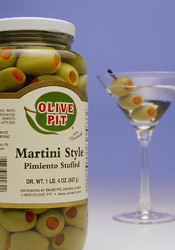 Garnish with a Martini style olive. This drink serves 2 people. Enjoy!